Lost on the stepping stones through time, could Jeanette and her friends ever find home again? The glowing stones seemed to throb with some unknown power. What were these stones and why were they here in this hidden cavern? All fifteen-year-old Jeanette Lacy and her younger brother Neil knew was that the stones were calling to them... and they couldn't resist! This is a YA novel - well suited to pre-teens and young teens. Nothing objectionable here. I read it because it is about one of my very favorite story elements - time travel. I always love to read how authors fantasize time travel would be. How would you cope if you accidentally found yourself in another time period? This is what happens to Neil and Jeanette and their new friend Jesse. This is the first book in a series and I see a lot of potential here. Read this one with your kids, if you have children of appropriate ages. 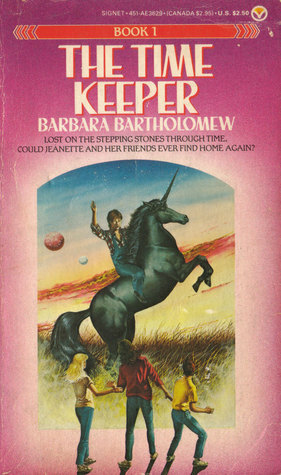 Barbara Bartholomew is the author of twenty traditionally published books and eight independent books and has had her short stories appear in many magazines including Seventeen, Analog Science Fiction, Highlights for Children and Cricket. 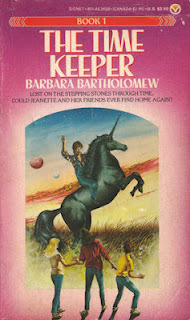 Many of her books are for young adults or younger readers and include The Time Keeper, Child of Tomorrow, When Dreamers Cease to Dream, Finding Endymion, Royal Blood and Princess Alice.